Fear gripped the villagers of Mulwad in Athani taluk following presence of crocodiles, as two young farmers found seven baby crocodiles at a pit near an open well in their farm on Saturday. Umesh Bharamdev and Suraj Gundwade were both shocked and thrilled on spotting the baby crocodiles when they were heading towards the switch board to start the irrigation pump set in the morning. On spotting the baby crocodiles, they safely shifted all the seven into a water-filled plate and alerted villagers. Several villagers, gripped with fear but equally curious, rushed to the spot. It was their first ever experience to see baby crocodiles alive, right in their own village. Although in panic, the villagers looked for mother-crocodile in vain. The presence of baby crocodiles evidently indicated presence of at least a full grown crocodile couple in close proximity of the village. The villagers have informed the forest officials, who were on their way to Mulwad when this report was being uploaded on all ‘aboutbelgaum.com’. The forest officials would be collecting the baby crocodiles and release them into their natural habitat, sources said. 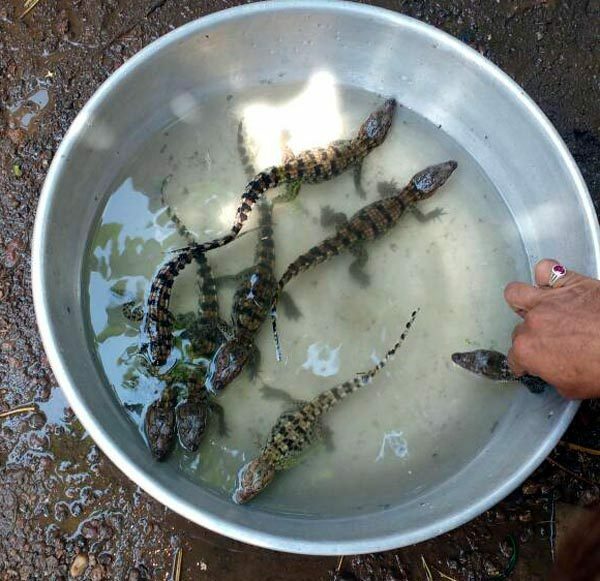 Interestingly, 22 baby crocodiles and six crocodile-eggs were found on the outskirts of Halyal village, a nearby village in same taluk on June 10.